Once upon a time, on the island of music, there was a girl who loved to drum, but only boys were allowed to become drummers. A lyrical, lushly illustrated book inspired by Millo Castro Zaldarriaga, the Chinese-African-Cuban girl who broke Cuba’s taboo on against female drummers. Margarita Engle is a Cuban-American poet and her words shine in Drum Dream Girl. 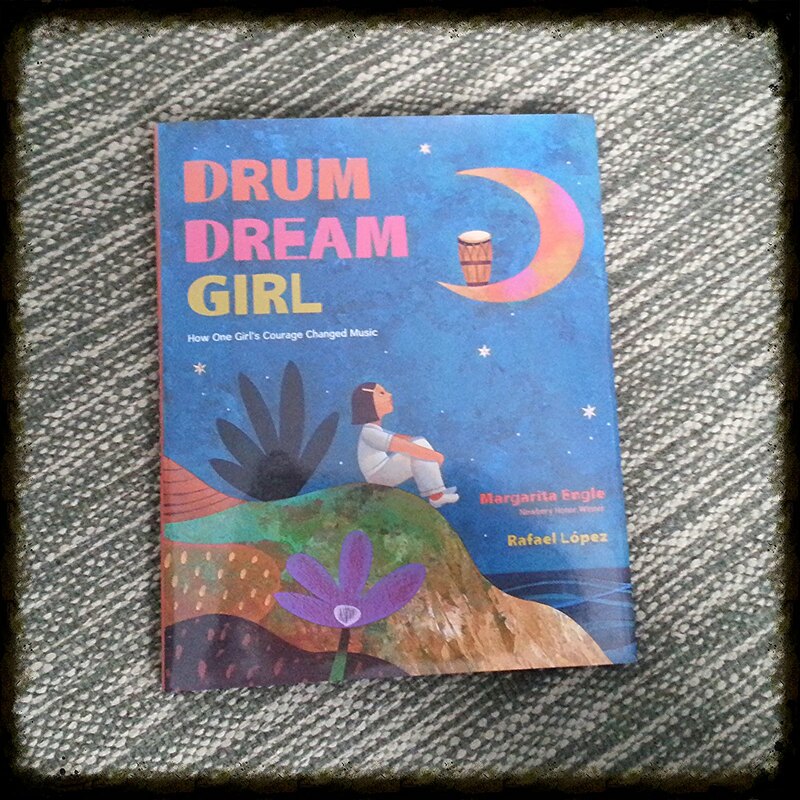 Rafael Lopez won the Pura Belpré Medal for his beautiful illustrations in this book. Such a delightful read! 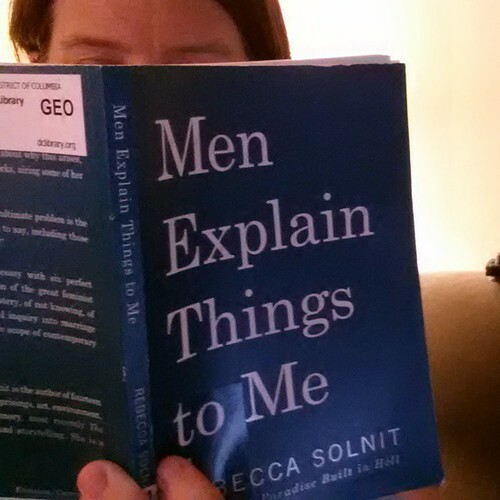 Rebecca Solnit’s Men Explain Things to Me is a slim volume, just 7 essays comprising 130 pages, but it gave me a lot to think about. Although the book is decidedly feminist, the essays are not, for the most part, about the stereotypical feminist issues. Although I could certainly relate to the titular essay (in which Solnit writes about a time that a distinguished older gentleman spent a great deal of time telling her about a book on Muybridge that she really must read (although he clearly hadn’t), which turned out to be one she had written), the essays that resonated with me most were about activism and uncertainty and the space to think. About how activism is important and has an effect, even if it’s not the one we expected. Solnit spent several years protesting at a nuclear site in the U.S. The protests were unsuccessful, in that they didn’t achieve the goal of shutting the site down, but that protest inspired a protest in Kazakhstan that did manage to shut down a Soviet nuclear site. This week especially, as we all sit here with what has happened in Ferguson, with the knowledge that it is just one killing of an unarmed black man, in a long history of the killing of black men, that was good to read. That activism is important and worthwhile even if you can’t see the end point, that to stand up for beliefs is vital and beneficial, even if the benefit is not what you expect. Sort of the butterfly effect of activism, which is something I hadn’t considered. I tended to think, up to this point, that you protest and speak out and it’s futile and futile and futile, until the moment things changes. And that you keep doing things, because you are waiting for that moment. But maybe the earlier protests weren’t futile at all. Maybe we just didn’t see the way they built the broader web of justice. Such a hopeful thing to think. “Woolf’s Darkness: Embracing the Inexplicable” was probably my favorite essay in the collection. It certainly made me want to read more by Woolf. The essay praises uncertainty, celebrates the unknown, reminds you that there a truths that you can only see sideways. Or that you glimpse for a second, and then they vanish, never to be seen again. Or perhaps they pop up again at some point in the future, in the words of an author or the image of artist that has managed to capture something so TRUE that it stops you in your tracks. As a librarian (and as a person – let’s be clear, my profession didn’t come from nowhere), I classify. I organize and arrange and make things fit. I write lists. But there are so many things that are amorphous. Hard to describe, hard to pin down. This essay reminded me to celebrate those. To give myself space to think, or more importantly to not think. To not fill up my time and my space and my brain and my life so much that there isn’t room for the unknown, for ruminating, for mysteries. It was a good essay. You should read it. H/T to Liz for encouraging me to pick this book up!